Does Facebook’s “War Room” really offer protection voters can trust? Facebook recently announced it is building a “war room” in the company’s headquarters dedicated to stopping election interference. Typically the plan has ignited some opposing opinions. Is the war room an honest effort to contribute to a clean election or simply another publicity stunt? 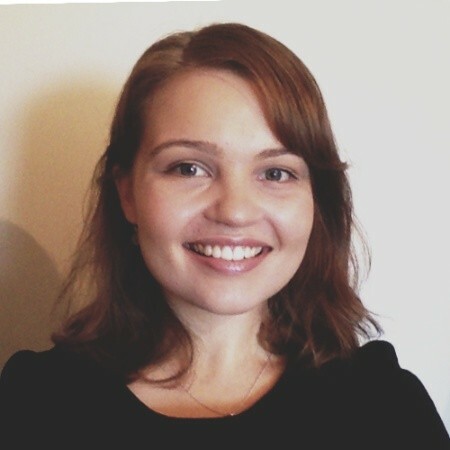 Promoting the initiative, Facebook invited several New York Times reporters to visit. The company is employing more than 300 people, with a core team of 20 “focused on rooting out disinformation, monitoring false news and deleting fake accounts that may be trying to influence voters before elections in the United States, Brazil and other countries”. 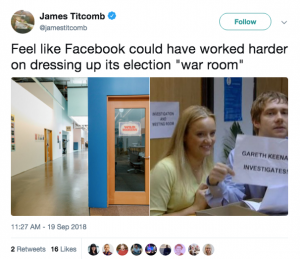 From the point of view of Samidh Chakrabarti who leads Facebook’s election and civic engagement team, the war room is “the biggest companywide reorientation since our shift from desktops to mobile phones’’. Chakrabarti’s enthusiasm isn’t however played out on social media platforms discussing the move. For instance, Tech Crunch editor, Josh Constine, points out that Facebook’s “reaction to scandals has gone from hesitant silence then apologies to full-court press blitz about its every counter-effort’’. Similarly, even the New York Times piece notes that “the war room’s half-finished state shows how nascent and hurried many of the efforts are”. 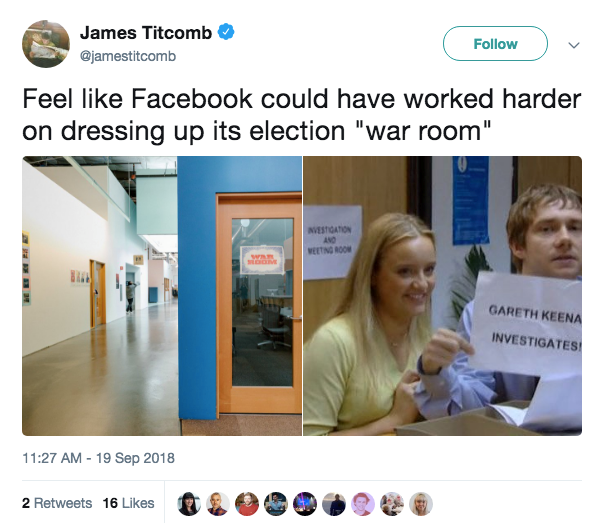 The Telegraph’s Silicon Valley Bureau Chief compared Facebook’s initiative to a scene from British comedy ‘The Office’, tweeting “Feel like Facebook could have worked harder on dressing up its election “war room”’’. 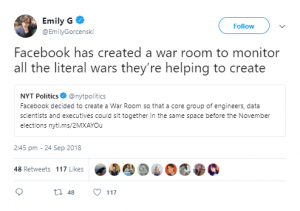 Most troubling however, is Gizmodo’s claim that “the social network does not have an in-house team dedicated to fact-checking’’ and “this War Room points to a future in which Facebook begins tackling one of its most – if not its most – menacing issues from the inside’’. If Facebook’s war room is indeed so under-prepared, is the company simply ticking a box or digging an even deeper hole for itself?